This past Conference Championship weekend in the NFL was as exciting as any in recent memory. Both conference championship games came down to the wire, went into overtime and were marred by plenty of officiating controversy. With that said, let’s take a look at what got us to a rematch of the 2002 Super Bowl between the Rams and Patriots. The first quarter of this rematch of a legendary game earlier this season was dominated by the Saints. New Orleans’ first drive culminated in a field goal, and they quickly added another three points after intercepting a Jared Goff pass that bounced right off Todd Gurley’s hands deep in their own territory. After scoring a touchdown following another empty Los Angeles possession, the first quarter ended with the Saints on top 13-0. The Rams, however, would not go down lightly as they were able to cut New Orleans’ lead to 13-10 thanks to a drive capped off by a short Todd Gurley touchdown run in the closing minutes of the half. The story of the second half that will undoubtedly be remembered by Saints and football fans for years to come was the egregious missed call in the closing minutes of the game. With the game tied at 20 and New Orleans driving deep into Rams territory with under two minutes remaining, Drew Brees dropped back to pass and fired toward his receiver Tommylee Lewis on the sideline around the five-yard line, where he was met by LA cornerback Nickell Robey-Coleman, who clearly hit him before the pass arrived. The officials failed to call the obvious pass interference and the Saints settled for a field goal to make it 23-20 with 1:41 remaining. Settling for a field goal gave the Rams plenty of time to march down the field and kick a field goal of their own to tie the game and force overtime, which is exactly what they did. After quickly marching into New Orleans territory, Greg Zuerlein drilled a 48-yard field goal to force overtime. The Saints won the coin toss in overtime but Brees quickly threw an interception upon being hit as he threw that helped set up LA’s game-winning field goal, which Zuerlein nailed from 57 yards (but easily would have been good from 70). Timely, opportunistic defense and Greg “the leg” and his famed right foot sent the Rams dancing to the Super Bowl with a shocking come-from-behind win in New Orleans. Much like in the first game, the older, more experienced Patriots jumped out to a commanding lead in the first half. At halftime, the Patriots led 14-0 and their defense held the vaunted Chiefs offense in check. Patrick Mahomes and the Chiefs, however, came out firing in the second half, capping off a quick, four-play first drive with a 12-yard touchdown pass to Travis Kelce. After two more touchdowns by running back Damien Williams on their first two fourth quarter drives, Kansas City took a 21-17 lead after falling behind 17-7 in the third. The final minutes of the game were where things really got interesting. The Patriots capped off a four-minute drive with a touchdown run by Sony Michel to retake a 24-21 lead with 3:32 remaining. The Chiefs and their dominant offense marched right back down the field to take the lead right back on Williams’ third touchdown with just over two minutes left in the game. 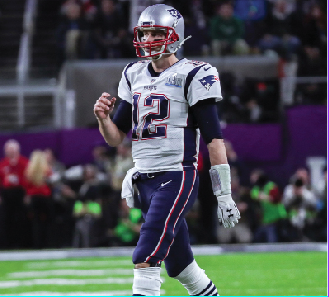 With two minutes and three timeouts, time was a non-factor for Tom Brady and the Patriots who moved the ball down the field quickly. The biggest play of the game came on this drive when the Patriots were in Chiefs territory, and Brady threw an errant pass that bounced off Rob Gronkowski’s hands and was intercepted, but the play came back, as Chiefs linebacker Dee Ford lined up offside. A few plays later, Rex Burkhead walked into the end zone to give New England a three-point lead with 39 seconds left. With such little time and only one timeout left, the Chiefs seemed dead, but Mahomes did what he has done all season and led the Chiefs down the field and set up a field goal to tie the game and send it to overtime tied at 31. In overtime, the Patriots won the toss, giving them the ball first. Brady and company walked right down the field, picking apart the Chiefs defense and ending with another Burkhead touchdown to give the Pats a walk-off win, leading them to their third straight Super Bowl. It was a shame Mahomes and the Chiefs never got a chance to see the field in overtime, but that’s the sad reality of NFL overtime.